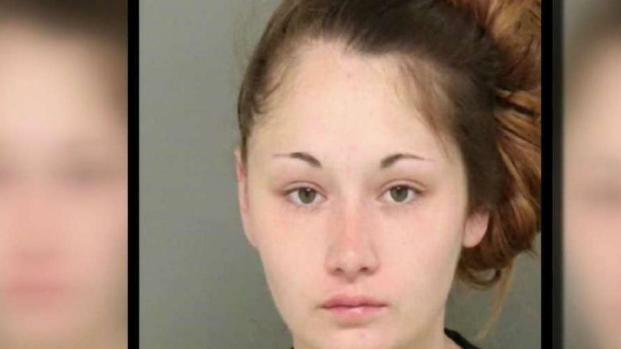 A 22-year-old woman escaped from a Santee detention center Saturday night, prompting a large search by local deputies. Destiny Marie Guns escaped the Las Colinas Detention and Reentry Facility (LCDRF) just after 6 p.m., according to the San Diego Police Department. Guns was arrested on April 1 on charges of possessing a stolen car, according to deputies. Guns’ jail clothes and sandals were found by search dogs, deputies said, though the dogs eventually lost her scent. Search is underway for an escaped inmate from Las Colinas Detention and Reentry Facility in Santee Saturday night. NBC 7's Erika Cervantes has more. 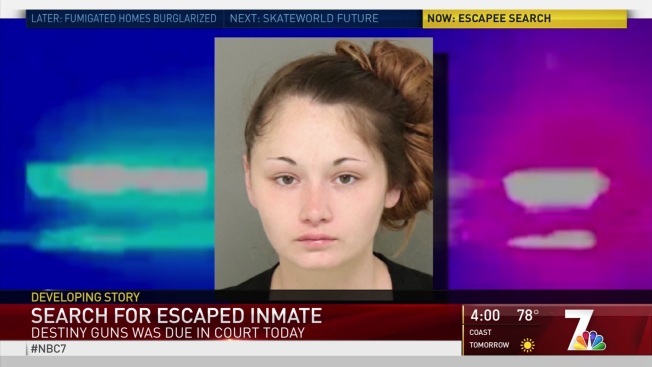 Before her escape, Guns was coming back from a medical appointment when she jumped over several high fences, according to deputies. Because Guns is a low-level prisoner and doesn’t have a history of violence, she was allowed to walk to and from her appointments alone. Her previous convictions include shoplifting and threat-related offenses. Officials said jail staff noticed Guns didn’t return from her appointment right away. Deputies noted that the living arrangements in the detention facility are bunks in a large room. There is increased law enforcement activity in the area of Cottonwood Avenue and Mission Gorge Road in Santee as Sheriff’s ASTREA search overhead with deputies on the ground. Guns is described to be 5-foot-2-inches tall and weighs 100 lbs. She has green eyes and brown hair according to the San Diego Sheriff Department. Guns also has tattoos of an elephant skull on her right arm and the word "Grasshopper" written on her chest. She was last seen wearing a white top and blue pants and lives in Santee said, deputies. Officers said a large perimeter of the facility, located at 451 Riverview Parkway, is being monitored. Some roads in the area were closed just after 6 p.m. and were reopened by 9:30 p.m.
Those scheduled to arrive at LCDRF were temporarily transferred to a detention facility in Vista, according to authorities. Authorities are going through phone records at the facility to determine if and who Guns called before her escape. Deputies believe Guns may have had help. Anyone with information call the San Diego Sheriff Department at (858) 565-5200 or Crime Stoppers at (888) 580-8477. Crime Stoppers is offering up to $1,000 for information that can lead to an arrest in this case.